(Lanka e News -10.June.2018, 11.00PM) President of Sri Lanka Pallewatte Gamaralalage Maithripala Yapa Sirisena yesterday (9 th) requested Britain to have London-based Lanka e News Editor Pradeep Sandaruwan Senadheera arrested or sent back to Sri Lanka, Sunday Times (10) reported in its front page. He made the request during a 30-minute a meeting with British High Commissioner James Dauris whom he summoned to his Paget Road residence. After summoning the British High Commissioner in SL James Dauris to his Paget Road residence specially , the president has made this request. President’s co ordinating secretary Shiral Lakthileke and defense ministry secretary Kapila Wiadyaratne , lawyer were also present on the occasion , Sunday Times newspaper reported ( full text of report is appended). Following inquiries made by Lanka e News , it was learnt that the defense secretary was silent , while the president and Shiral Lakthileke were explaining . The High Commissioner has not uttered a word , and has only recorded the statement . 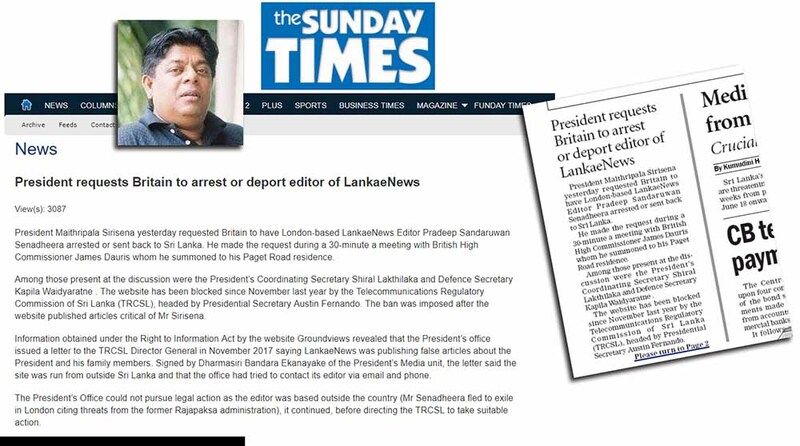 However it is not known on what grounds this request to arrest or deport Lanka e news editor was made. It is worthy of note Pallewatte Gamarala never had summoned a foreign envoy and instructed to arrest or deport the criminals Udayanga Weeratunge or Jaliya Wickremesinghe who are grave facing criminal charges and hence have fled the country, and in hiding . Neither has the president taken any action to arrest or deport V. Rudrakumaran who has formed a Tamil Eelam Trans national government and outrageously proclaimed to the world he is its prime minister . The desperate victims of the recent floods who are in dire straits must be questioning the president , Waidyaratne and Shiral , why wasn’t the British High Commissioner specially summoned to ask for flood relief aid to alleviate their sufferings ? Might we recall it was only after Lanka e News exposed the sordid Russian warship deal of the president , Lanka e news was proscribed in November last year within SL even without obtaining a court order.